Jim was enthusiastic about the Sesame Street merchandising program and particularly enjoyed working on the record albums. The previous year, The Muppet Alphabet Album had been great fun, working with the team to write and perform songs representing all twenty-six letters. Getting together in 1972 to create an Ernie and Bert album would have involved spending time with some of Jim’s favorite people – writer Jerry Juhl, performer Frank Oz (Bert to Jim’s Ernie), and composer Joe Raposo. The resulting album, Havin’ Fun With Ernie and Bert, included songs meant to engage the listeners and encourage them to get up and move around. A particular favorite among Jim’s five children was Tiger Hunt, an exercise and celebration of a child’s imagination. By 1973, Ernie and Bert had international popularity. 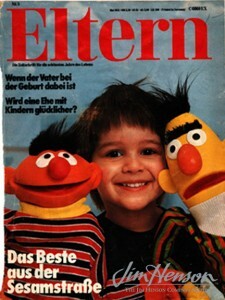 This German magazine featured toy versions of the pair on the cover. This entry was posted in 07-July '72, 1972, Sesame Street and tagged Bert, Bert and Ernie, Ernie, Ernie and Bert, Jerry Juhl, Joe Raposo, The Muppet Alphabet Album, Tiger Hunt. Bookmark the permalink.